Maintain Your Home. Findings of a Home Inspector. Reading this article will not guarantee that you will sell your home. It offers observations of issues found in homes both new and old. However, older homes usually contain more issues. If you are planning to sell your home and would like to have a Seller’s Inspection conducted please call Regal Home Inspections, LLC. We can perform a thorough inspection and make recommendations that should help any buyer feel more comfortable in making an offer. 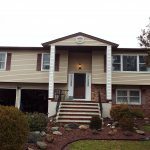 We can perform a New Jersey Administrative Code (NJAC) compliant home inspection. We can conduct a radon test and have your house professionally inspected for termites and Wood Destroying Insects and Wood Destroying Organisms (WDI/WDO). We can also conduct pool inspections. If issues are found we can help facilitate additional levels of expertise. All in an attempt so that your home, a small cape cod or a country estate, will be better prepared for the eventual buyer’s inspection and closing! I have inspected homes of various ages, sizes and in different geographies; Bergen County to Ocean County. Some have been urban and some suburban. From 1200 square feet to approximately 8000 square feet. From 1 furnace and no air conditioners to a single home with four furnaces and 5 air conditioners. Regardless of the age, size, price or location there have been inspection related issues found with nearly every inspection I have performed. In this article I will share some examples because they are probably not the type that the seller has ever considered. Some are easy to prepare for. Some not as easy and you should be prepared. It’s when the seller is unprepared and the item is deemed to be significant* that there’s potential for contention. * Significant is subjective when it comes to the buyer. Items of note should not be subjective for the inspector but one never knows how the buyer will judge an issue. Some examples are in the article. The NJAC has many requirements of an inspector. However, when it comes to the actual inspection and the reporting there are a few key points. The NJAC follows the Standards of Practice of the American Society of Home Inspectors (ASHI). When it comes to the inspection, the inspector is required by law to DESCRIBE specific systems and components of the house; Plumbing, electrical, exterior, etc. The inspector is required to IDENTIFY any Material (aka Major) Defects; Findings that effect the habitability, safety or value of the home (in very simplified terms here). And the inspector is required to PREPARE a written report memorializing the previously mentioned elements. What the inspector is not doing is determining if the curtains match the rug. If the choice of siding materials matches or clashes with the general theme of the other houses. We are looking for very specific things that are not otherwise apparent to the buyer or the seller and for this reason, it’s a very good idea for the seller to be as prepared as best as possible. You painted the walls so they look fresh, right? You had the grass fertilized and the bushes trimmed so the yard has curb appeal, right? Maybe you’ve even put some chocolate chip cookies in the oven to make the house smell good for that open house? Having your furnace or air conditioner serviced? Checking to make sure your electrical system was up to date? Did you check to make sure there aren’t any leaks under any of your sinks? Did you check to make sure your dryer vent is clean and relatively lint free? The inspector will go even further. Let’s look at some examples. How old is your garage door and garage door opener? Since 1993 garage doors have to have entrapment protection mechanisms. In fact the NJAC REQUIRES that they inspector check for functioning garage door entrapment protection mechanisms. Furthermore, if they are not functioning properly, this is classified as a SAFETY issue (remember the Material Defect definition in the NJAC? I paraphrased above but SAFETY issues are included). Do you know what the difference between a guardrail and a handrail on a set of steps? The inspector better and if there isn’t either where they should be that too is a SAFETY issue. On a related note, do you know how far apart the spindles of a guardrail should be? If they are too far apart this is a SAFETY issue. While we’re on the general subject of steps and stairs, do you know how high a step’s riser (the vertical part) can be? How about the minimum depth for the tread (the part where your foot goes) before it too is a SAFETY issue? Your water heater and air conditioner are working fine, right? As a home inspector part of our inspection process is to determine how old some of the major appliances are. When I mention, “Major appliance” I am referring to water heaters, furnaces and central air conditioners, not microwaves as an example. If you, as the seller, don’t have receipts or records of when the water heater, furnace or air conditioner was purchased, the inspector can almost always determine the manufacture date from the serial number. Different manufacturers code the date differently but it’s almost always there. Sometimes the year is coded to a letter or the year is abbreviated; “0803” for manufacture the 8th week if 2003 or C99 where the “C”, 3rd letter in the alphabet corresponds to March and the “99” is 1999. What’s my point? If the water heater, AC or furnace is too old it may be flagged as a Material (aka Major) Defect. It’s not subjective but it’s objective. If a water heater is 20 years old, it is well past its typical useful life and every day that it continues to work is a gift. The buyer is being told by the inspector that they should have no (zip, zero, nada) expectation that the 20 year old water heater will work another day and therefore, the “value” of that NJAC required system or component is practically $0 but there is an expectation that the house’s price includes a working, functioning and reasonably reliable water heater. The seller thinks it is but the inspector will use the facts to determine that it is not. Here are a couple that aren’t as obvious. For a single family home or townhome, there is often an attic. A space above the regular living area but below the surface of the roof. The science behind most attic designs is that the air inside the attic should be the same temperature as the outside temperature. In the summer it’s tough to keep the attic at 90 degrees on a day when it’s 90 degrees and sunny out but in the winter, when it’s 5 degrees outside, the attic science says that the air temperature in the attic should also be 5 degrees. Why? Well, if the air in the attic is 50 degrees when it’s 5 degrees outside, where might that heat source be coming from? Some may be the sun load but most is probably heat leaking from inside the house’s living space into the unheated attic. Do you pay to heat your attic when there’s no one living or sleeping there? I don’t. Secondly, when the roof is snow covered, if it gets too warm inside the attic the snow on the roof will melt and the water will freeze. The water will make its way up under the roof shingles and then freeze. Constant freeze thaw cycles will shorten the life of your roof surface. I just had my roof replaced at my home. The manufacturer’s warranty states that the warranty does not cover damage due to, “Inadequate ventilation”. Inadequate ventilation will cause the roof surface and the sheathing (plywood) below to get way too hot in summer and the freeze damage mentioned in winter. Proper ventilation helps in all seasons. I’ve had this come up twice in the last few weeks. A situation that I don’t believe any homeowner would notice but one that will be identified as a SAFETY issue on an inspection report. Many homes have had old oil furnaces replaced with newer gas furnaces. Perhaps the water heater too. I came across this situation this week. A couple of weeks ago I saw an old wood burning fireplace converted to a gas fireplace. The old designs for both these houses had oil or wood appliances and properly designed and sized flue pipes were originally built. The clay flue pipes inside the chimneys were built to a height that allowed the hot (oil or wood) exhaust to rise up the flue and exit the chimney where the vapors cooled. Please note that the exhaust is very caustic and when it cools it condenses into water which is also, caustic. Comparatively, believe it or not, gas appliance exhaust isn’t as hot as oil exhaust or wood smoke. When the gas exhaust enters the clay flue in the original chimney, since the gas doesn’t start out as hot, it actually cools and condenses before it leaves the clay flue pipe. The caustic materials in the gas have now attached, mixed with water, inside the clay flue pipe. 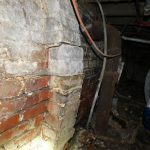 Over time this caustic water can corrode the clay, the mortar connection clay sections and the mortar and brick of the chimney’s structure. When the appliance is upgraded to gas, an insert should be installed. The metal flue duct will reduce the diameter and make the draft characteristics of the metal flue pipe much more efficient and appropriate for a gas appliance. Regardless if you are buying or selling a home, it is a significant transaction either way. Buy with confidence and sell with pride by having Regal Home Inspections, LLC conduct your inspection. We look for things that you probably never considered. That’s why we can help you avoid issues and delays in closing when the buyer and seller are of different minds on whom should address inspection item A, B or C. We can help get some of them out of the way for the seller or help the buyer identify issues that may not be obvious. Regal Home Inspections, LLC starts every inspection with the presentation of a folio of information for the client. That folio includes general information but also includes a written introduction to the inspection. I present an initial overview of the main elements detailed in this article; Laws that govern the inspection process, areas that will be inspected and more. I believe this is unique to the service that Regal Home Inspections, LLC provides.